In our last few posts, we acknowledged the two interns from Mohegan and Mashpee who worked with us this past year. That gave us an idea to post a short summary of some of our accomplishments during 2018. Helping us with our editorial tasks this year, besides Eric and Danielle, were a number of people. Julie Fisher tackled a hefty load of Massachusetts Archives materials. In an upcoming article, we’ll share some of the transcription stumpers she had to deal with. Anya Montiel, a recent Yale graduate and now an Assistant Professor of Art at the University of Arizona School of Art, spent the summer transcribing Phineas Fish’s correspondence with Harvard authorities about the Mashpee troubles in the 1830s. This year we had two university classes contributing to the transcription production. Students from Amy Harris’ Family History program (Brigham Young University) transcribed secretary and mixed-hand materials from the National Archives of the U.K. and the Massachusetts Archives, while those in Jeff Glover’s English Department Seminar (Loyola University, Chicago) addressed documents from the King Philip’s War period. Also working with editors in producing Scholars’ Transcriptions were Michael Vander Heijden and John Nann from Yale’s Law School Library. More on all these assisters in the weeks to come. We’ve moved to a new web platform, The Native Northeast Portal. It’s built upon the Mukurtu Content Management system that provides for the ethical curation and sharing of Native cultural heritage items. 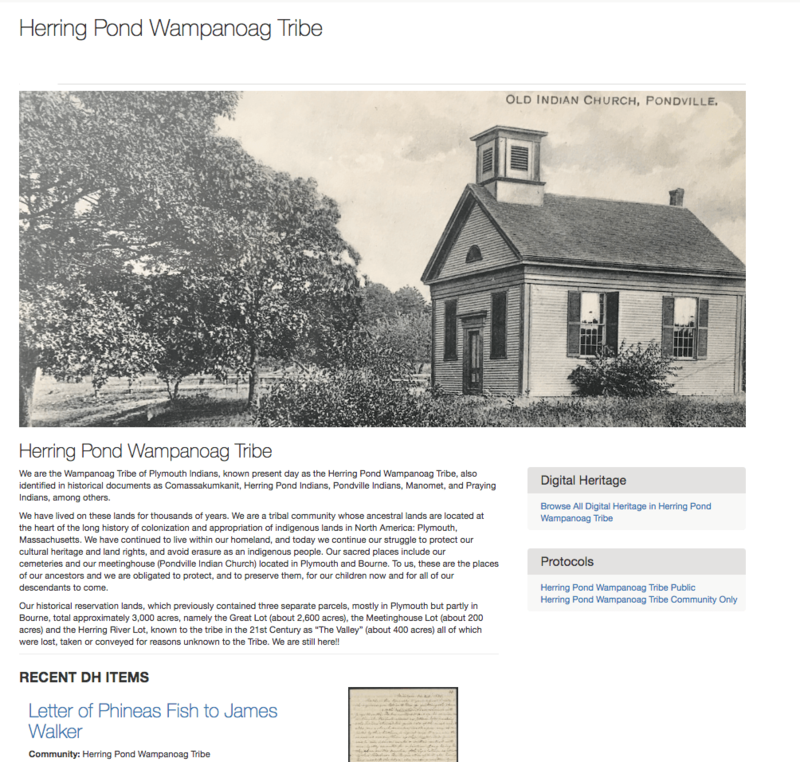 While most of the materials there relate to Massachusetts tribal communities, we will soon be uploading the over 2,000 Connecticut documents migrated from our older platform, the New England Indian Papers Series, into the Portal to bring our records into one single repository. More work is being done to provide better access to the information and to improve the website’s looks. We’ll keep everyone posted about our progress. During the past year, members of the following Massachusetts Indian tribes have assisted Project editors with the review of digital heritage items. Tribal representatives assess documents relating to their community and to those historical Native communities that no longer survive but to whom they have existing meaningful relational ties. Depending on the subject matter of a particular document, community review may be required of multiple tribes. One of the more responsive features of the Native Northeast Portal is that it allows for dialogue within a community, among communities, and possibly with scholars and the interested public. In some instances, tribal representatives have created their own Portal landing pages, with text describing their community and a profile image of their own choice (see image on left), or built out their community record further by assigning keywords of their own and providing cultural narratives to accompany a document. In February, as part of the Project’s on-going Thomas Commuck’s Indian Melodies Initiative, the Brothertown Indian Nation, the New Haven shape note singing community, the Yale Institute of Sacred Music, and the Yale Indian Papers Project hosted a public singing and sharing. The event was filmed by a Yale Divinity School graduate student, who is writing his Masters Thesis on the Initiative. A sample clip can be seen here. 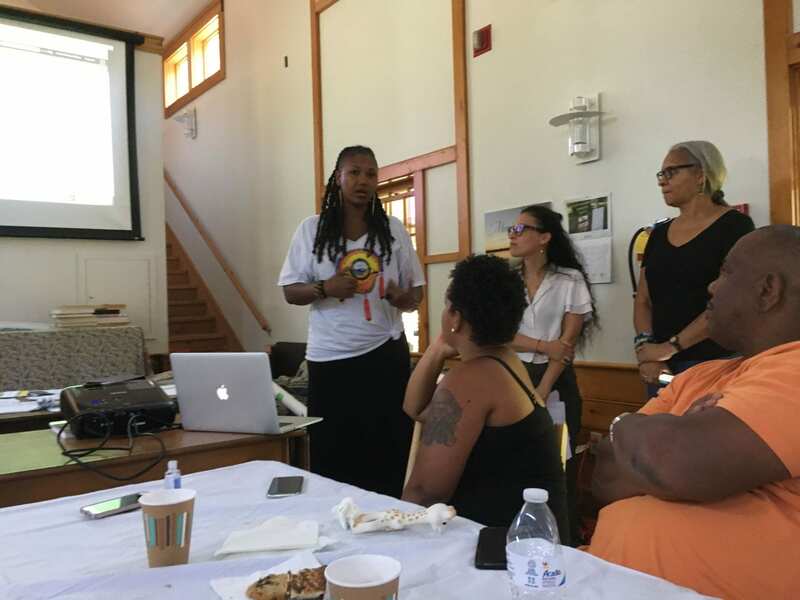 A group of Yale students, shape-note singers and members of the Brothertown Indian Nation hosted a similar event at the All Nations Indian Church, Minneapolis, MN, on July 28, 2018. 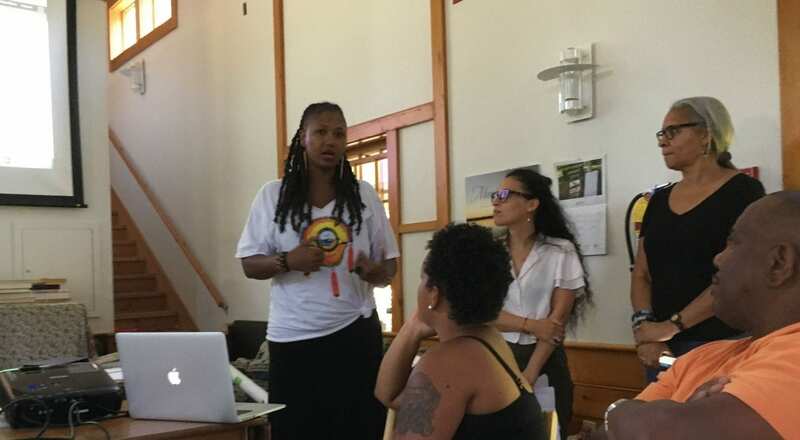 In May, the Stockbridge-Munsee held a conference, Remembering the Indian Nations in American History, at the Town Hall in Stockbridge, Massachusetts. In one session, several tribal members read passages from documents their ancestors wrote and reflected on the relevance of the messages to today’s community. During the 200th Anniversary Celebration of the Cornwall Indian School in Cornwall, CT in June, editor Paul Grant-Costa assembled primary source materials in Yale archives relating to Henry ‘Ōpūkaha‘ia (Obookiah) for a visiting delegation of his Hawaiian descendants to the University campus. Later that month, editors presented to the Eastern Pequot Tribal Nation/University of Massachusetts archaeological field school working on the reservation in North Stonington, CT.
On a sad note, we mark the passing of one of our tribal consultants this year, Donna Mitchel (Minoweh Ikidowin, Cloud in the Wind), a descendant of 1800s medicine man and shaman, William Pequot Pellawango Perry from the Indian community at Fall River, Massachusetts. 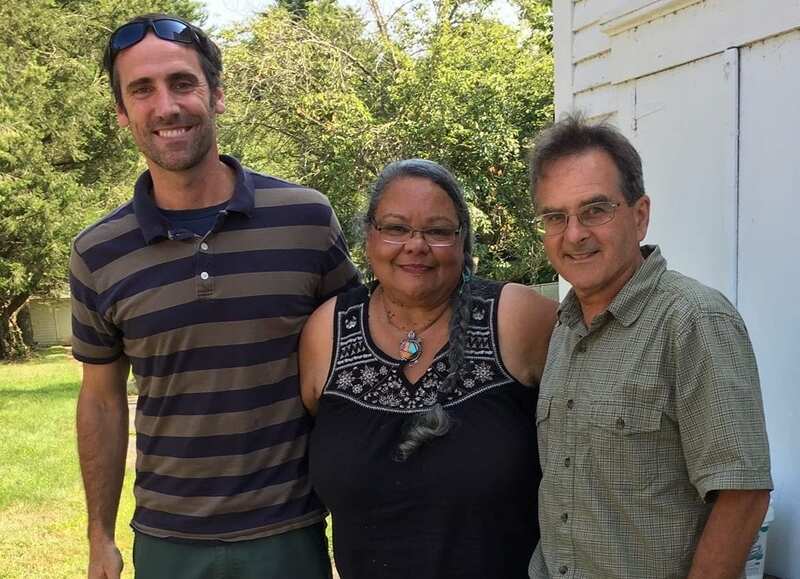 We met Donna two years ago at the Wattuppa reservation homestead and were struck with her knowledge, enthusiasm, dedication to her family, and preservation of Fall River’s Indian history, especially the Perry Clan. You can watch interviews with Donna, Traveling the Wampanoag Trail with Minoweh, here and here. The accompanying image is of Tobias Glaza, Donna, and Michael Lebossiere, Watershed Forester, City of Fall River. Throughout the year, we engaged the academic community, through presentations to Yale classrooms and providing individual students with resources and guidance for research projects and course papers. 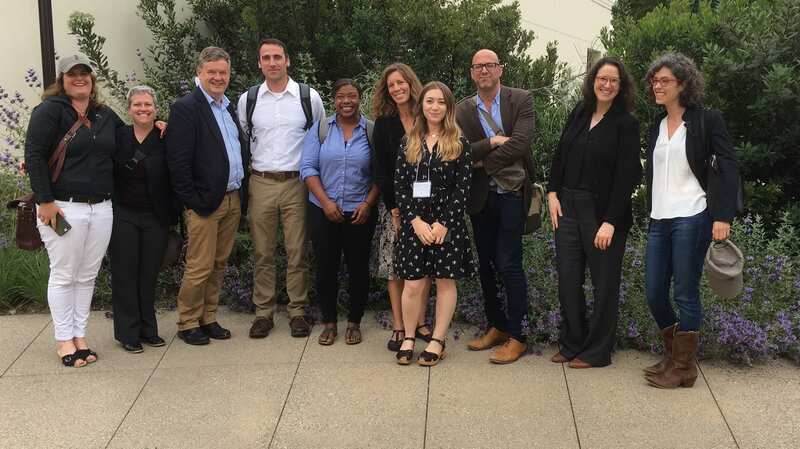 In May, we traveled to the Huntington Library in Los Angeles, California to participate in the William and Mary Quarterly/Early Modern Studies Institute Workshop, Archives-based Digital Projects in Early America, Organized by Molly O’Hagan Hardy, Peter Mancall, and Joshua Piker, the two-day event was designed to bring together digital scholarly technologies that offered fresh perspectives on the early American past. Other panel discussants were from the Jesuit Plantation Project, the George Washington Financial Papers Project, the First Books Project, The Early Novels Database, the Early California Populations Project, and the Georgian Papers Programme. One of the initial goals of the Yale Indian Papers Project when we first began over sixteen years ago was to provide a robust set of primary source materials to increase the scholarly literature on the history and culture of New England Indians. It always amazes us every year to see the number of Masters’ theses, dissertations, and scholarly publications that use documents from either the New England Indian Papers Series or the Native Northeast Portal. Of these, we note the following from 2018. Karen O’Brien, Petitioning for Land: The Petitions of First Peoples of Modern British Colonies (London: Bloomsbury Academic, 2018). Jenny Hale Pulsipher, Swindler Sachem: The American Indian Who Sold His Birthright, Dropped Out of Harvard and Conned the King of England (New Haven, CT: Yale University Press, 2018). Lisa Brooks, Our Beloved Kin: A New History of King Philip’s War (New Haven, CT: Yale University Press, 2018).